This must be a good day for the competition. 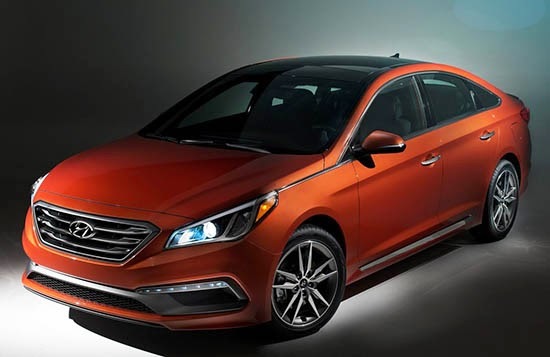 After shaking up the midsize segment with the current generation, the Sonata is now taking a huge step back. With a design that looks older than the current car. I was just reading an interview with a Nissan designer who was mentioning the current Sonata as an inspiration. That is was a huge step forward and how they want to to that with the next Altima. Well, this one will inspire no one. Pretty much anything else looks more modern now. It doesn't look like much in the pictures, that's for sure. I guess the exhaust tips are nice, but even those look out of place on this car. This Sonata is really strange. It's almost third world looking. As if they took the silhouette of a Fusion, A7 or Rapide, and then had some pre-2008 Hyundai designers finish it off. A hatchback-looking fastback sedan needs to be beautiful. Or else it will just look frumpy and utilitarian. As this does. The exterior design is fine (except for the position of the door handles, which should have been positioned in the side crease instead of below it). The interior is definitely a deal breaker, though. It is horribly outdated, boring, cheap looking, and a huge step backwards compared to the current Sonata. 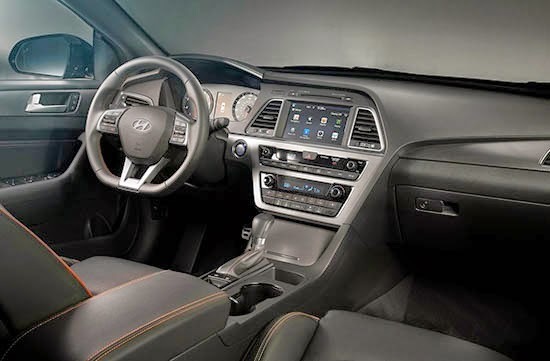 It has to be the worst looking interior in the mainstream midsize sedan segment. How sad. That interior is 14 days too late for a bad April fools day joke... Looks horrible. I simply can't believe that someone signed off on that interior. I think this car will appeal to older folk. Exterior is quite conservative as is the interior. 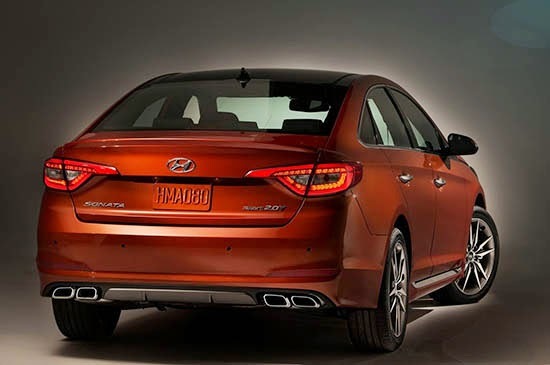 Although the current Sonata is guilty of being over styled, this model seem toned to bore. Hyundai reports sales of this new model in South Korea is going quite swimmingly but apparently they forgot about the U.S. market with this redesign. With the depowered engines of the 2.4 now down from 200 to 185 and the 2.0 turbo down from 274 to 245, more emphasis has been placed on delivering torque rather than inflated horsepower which was never the strong suit of this car. Speaking of emphasis, it appears Hyundai is focused on fixing a number of issues that are inherent in the current model. For one, the atrocious suspension system, abominable EPS steering and increasing the torsional stiffness of the car to reduce body flexing or side to side wallowing, you know the feeling you get when you're in a small boat. The materials used for the interior are supposedly much improved and hopefully so are the seats. And speaking of the seats, they finally added an height adjustment for the passenger seat. Wow! What took them so long to figure that out? I think the problem with Hyundai is that they build this car first for the local market and then try to adopt it to the U.S. market later. where as it seems the current model was styled by U.S. designers, this one seemed wholly co-opted and done by their South Korean contingent which generally means bland, bland and less imaginative, group think. I don't believe the new model will sell less but I'm on the fence about whether it will increase the flagging sales of the current model which is being outsold by the smaller Elantra. Strange to say this but I believe Hyundai may spent more time and resources getting the driving dynamics right at the expense of letting the design lag on this car. One other thing, the miles per gallon rating on this new model will probably be about the same as the current one which isn't saying much competitively if you can't gain on makes like Malibu, Camry, Altima and Accord. There is a reason why John Krafcik is no longer with Hyundai USA and is seems like they've lost some of that mojo since he left. I think old folks will gravitate toward the Camry and Fusion over this. It will be a rental lot darling and sell only with special incentive and lease deals. Sorry, but this car looks way better than the previous one. They finally got rid of all the screwy weird body lines and cleaned it up. It has more dignity now and looks like like something that should sit out in front of an aquarium. I'd be far more likely to buy one of these now that it looks a little more tasteful. They are still a company that is leading design trends right now.